Heat pump package unit has all its components located in one housing. The unit is usually placed on the roof top of a building or a flat place outside of the building. The conditioned air is then ducted into the building to cool or heat the space during summer or winter. The package air-to-air where the heat is rejected or sourced from the ambient air will be discussed here. On the contrary, the heat pump split system has separate indoor and outdoor units in which both units are connected to each other through the liquid and gas lines. The indoor unit consists of a fan, coil, expansion valve and electronic control board. The outdoor unit consists of a fan, coil, 4-way-valve, a compressor and outdoor thermostat. 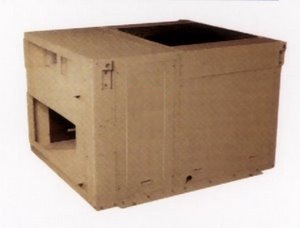 When you encounter the word "package", it means that all the components needed for the unit to function are enclosed in a single housing. The conditioned air is then channeled to the various rooms by using ducting. Here are the basic working principles of a typical package unit. Controls may vary depending on the design of the manufacturers. During warmer days, the thermostat is set to COOL mode and the set temperature is set as desired such as 75°F (24°C). 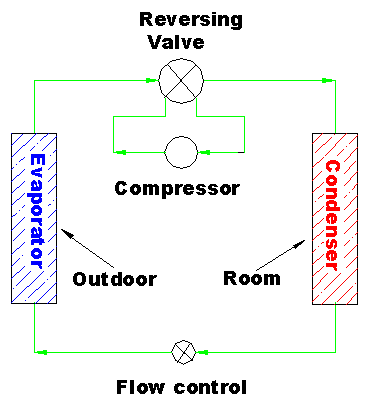 When the room temperature is higher than the set temperature, the output that controls the 4-way-valve will turn ON. The indoor blower fan, the outdoor fan and the compressor outputs will than turn ON. When this happen, the system is operating in the cooling mode in which the hot gas from the compressor is diverted to the outdoor coil by the 4-way-valve. The system will continue to operate until the room temperature is below the set temperature by a certain degree. Once this happens, the compressor, outdoor fan and indoor blower fan(will continue to on for some design) will turn OFF. The information discussed here is valid for the ON/OFF type compressor and not the inverter type. Inverter type compressor requires a much more complicated electronic controls and cannot be controlled by using the normal thermostat. When winter comes, hot air is required to heat up the room. The thermostat is set to HEAT mode and the set temperature as desired such as 80°F(27°C). The 4-way-valve will then turn OFF. When the room temperature is lower than the set temperature by a certain degree(depending on the thermostat used), the indoor blower fan, outdoor fan and compressor will then turn ON. As the 4-way-valve is OFF, the hot air from the compressor is directed to the indoor coil. The system is now operating in heating mode. When the outdoor temperature continues to drop, the amount of heat that can be transferred begins to reduce. In order to continue to provide heating to the room, the auxiliary heater from electric, oil or gas will turn ON. Depending on the controls used by the manufacturer, using an outdoor thermostat to control the auxiliary heater is common. If the heat pump fails, the Emergency Heat mode can be used to heat up the room. However, it should be a temporary measure as the COP of the auxiliary heater is not as good as when running the heat pump system. When running in heat mode, the outdoor coil operates as an evaporator. When the outside temperature begins to drop below 50°F(10 °C), the coil will begin to freeze. When this happens and by measuring the temperature and the time of the freezing, the defrost mode will be initiated by the control. The control can be a defroster or directly from the main controller. During defrosting, the unit is working in cooling mode. The 4-way-valve will be switched ON, the outdoor fan OFF and indoor fan OFF(depending on design) but the compressor will be operating. During this time, the heat from the inside the building will be extracted to the outside to heat up the ice. The outdoor coil is now a condenser and the indoor coil behaves as an evaporator. After the ice has been defrosted, the system will switch back to the heat mode to heat up the room.